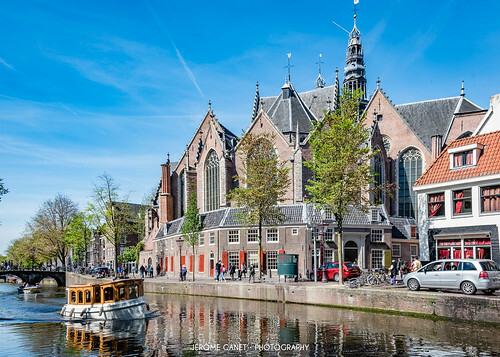 The 800-year-old Oude Kerk ("old church") is Amsterdam’s oldest building and oldest parish church (hence the name), founded ca. 1213 and consecrated in 1306 by the bishop of Utrecht with Saint Nicolas as its patron saint. After the Reformation in 1578 it became a Calvinist church, which it remains today. It stands in De Wallen, now Amsterdam's main red-light district. The square surrounding the church is the Oudekerksplein. 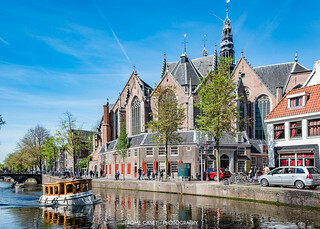 Here is a view of the back of the church along the Oudezijds Voorburgwal canal.